A great smile is a sign of of happiness and confidence, and a huge factor in your overall health. But if your teeth, gums, or mouth are causing you discomfort, pain, or a lack of confidence, it might be time to take steps toward better oral health. Here are a few signs that you should pay your neighborhood dentist a visit. Your teeth are abnormally sensitive to heat and cold. There shouldn’t be any tooth or mouth pain from drinking an ice-cold glass of water or a hot cup of coffee. Sometimes, brushing too vigorously or using a hard-bristled toothbrush can be enough to cause tooth sensitivity, but sometimes, the cause is more difficult to diagnose. If your teeth are sensitive to everyday hot or cold food items for a prolonged period, it might be time to consult your dentist, as your teeth shouldn’t prevent you from enjoying any regular foods or beverages. Your gums frequently bleed or swell from brushing and flossing. Sore, tender, red, and bleeding gums can be caused by new medications, a new toothbrush, or even a new flossing routine. However, these symptoms could potentially be a sign of gingivitis caused by plaque and tartar buildup near the gumline. Make a trip to your dentist if irritated gums persist so they take take down gingivitis at the source. You have pain in your mouth or jaw. Pain in the mouth and jaw cause difficulties with talking, chewing, swallowing, and sleeping. This pain can be caused by teeth grinding in the night, Osteomyelitis (a combination of jaw pain, swelling, and fever), Temporomandibular Disorder (TMD), and several other less common ailments. If your mouth or jaw are causing you any level of discomfort, it’s best to have your dentist diagnose and treat the problem sooner rather than later. You have a sore that isn’t going away. Mouth, tongue, and gum sores can be caused by many factors, ranging from common cold sores to viral infections and oral diseases. If your sore isn’t going away or increases in size, make a trip to the dentist so they can quickly take care of the problem. You don’t like the look of your teeth. Dissatisfaction with the look or color of your teeth is an excellent reason to visit the dentist. Whether it’s a simple teeth cleaning, Invisalign® braces, or a complex dental implant, dentists are in the business of keeping your teeth, jaw, and mouth looking and feeling healthy, and giving you the confidence you need to show off those pearly whites. You haven’t been to the dentist for awhile. 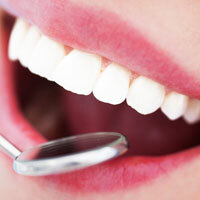 If you haven’t been to the dentist in a year or more, you’re past due for an oral health wellness exam. The most effective and satisfactory dentistry is preventative dentistry, which can help you avoid the trouble of painful and uncomfortable oral diseases, costly oral surgeries, and unsatisfactory oral hygiene and health. That’s where Clopper’s Mill Dental Care can help. We are the Germantown’s top-rated dentist, with a mission to provide quality dental education and effective preventative dentistry—so you can have a brighter smile, and a happier, healthier life. Clopper’s Mill offers general dentistry services, dental implants, Invisalign braces, oral surgery services, oral cancer screenings, and more for families in Germantown, Clarksburg, and Gaithersburg. Contact us today, and help yourself and your family achieve better oral health!